Ethio­pian Airlines stated immediately following the news conference that the preliminary report showed no fault lay with the pilots. 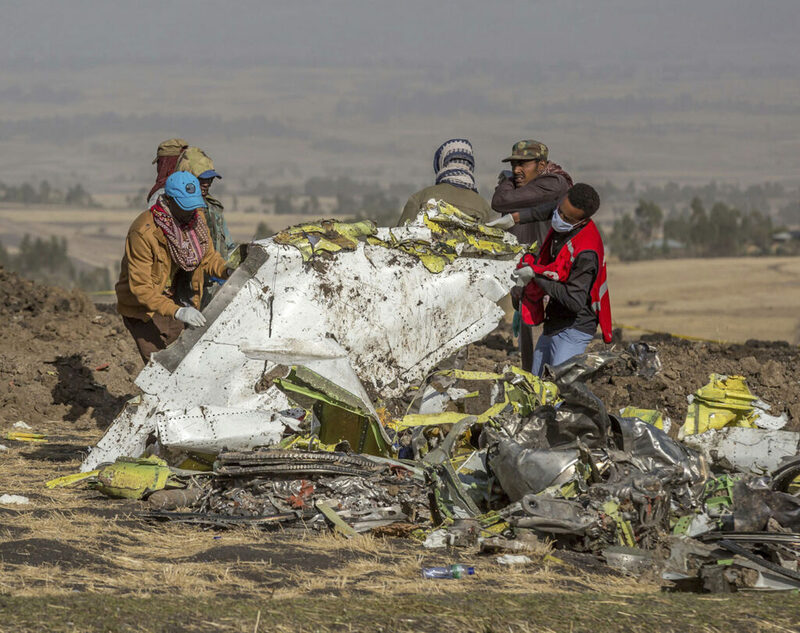 ADDIS ABABA, Ethi­o­pia — The Ethio­pian Airlines pilots performed all the procedures recommended by Boeing to save their doomed 737 Max 8 aircraft but could not pull it out of a flight-system induced dive, a preliminary report into the crash concluded Thursday. Minister of Transport Dagmawit Moges gave a brief summary and the recommendations of the much anticipated preliminary report into the March 10 crash, in which she singled out the “aircraft flight control system” as contributing to the plane’s difficulty in gaining altitude from Addis Ababa airport before crashing six minutes later and killing all 157 on board. “Since repetitive uncommanded aircraft nosedown conditions were noticed in this preliminary investigation, it is recommended the aircraft flight control system related to flight controlability be reviewed by the manufacturer,” she said. Like the crash of an Indonesian Max 8 aircraft in October, attention in the Ethio­pian Airlines crash has been zeroing in on a flight control system known as the Maneuvering Characteristics Augmentation System or MCAS, which pushes the nose of the aircraft down to avoid a midair stall. While she never mentioned the MCAS by name during the news conference despite repeated questions from journalists, Moges’s comments suggest that the system was activated during the flight and the pilots were not able to use Boeing’s recommended methods to disable it. Investigators believe MCAS also contributed to the Oct. 29 crash in Indonesia, where they say erroneous data from an outside sensor led the system to force the nose of the plane down over and over again. Pilots were unable to regain control and prevent disaster, and the Lion Air flight eventually plunged into the Java Sea, killing 189 people. After the Indonesia crash, Boeing issued a bulletin outlining how to shut down the MCAS in case of malfunction and Thursday’s preliminary report seems to indicate the pilots’ followed that procedure. Previous evidence found at the Ethio­pian crash site showed equipment on the 737 Max’s tail was positioned in a way that would push the plane’s nose down. Satellite data also showed the Ethiopian Airlines jetliner had ascended and descended multiple times after takeoff, mirroring the behavior of the plane in the Lion Air flight. Both flights struggled to gain altitude; and both appeared to have erratic flight paths before crashing. Amid reports that a foreign object might have damaged one of the Ethio­pian plane’s sensors on take off, Amdeye Ayalew, the head of the investigation, said the information from the data recorders did not indicate that. “We did not find any information regarding the foreign object damage on the aircraft,” he said. The officials said a full report would be completed within a year of the crash. “Despite their hard work and full compliance with the emergency procedures, it was very unfortunate that they could not recover the airplane from the persistence of nose diving,” the airline stated. The similarities between the two crashes, five months apart, prompted aviation authorities to ground more than 370 of the jetliners worldwide. The new investigative report also reveals some differences between the two flights. For example, the Ethiopian aircraft had no mechanical problems before the crash. By comparison, the Lion Air had had multiple issues starting Oct. 26, including the four flights before the one that crashed into the Java Sea on Oct. 29, according to the Indonesian preliminary report. The plane’s maintenance log showed pilots reported defects with incorrect display of speeds and altitude and Airline mechanics worked to resolve the problems. The Max 8 single-aisle aircraft is the most recent iteration of the 737 line — the world’s most popular commercial airliner that first flew in 1967. The Max is the fastest-selling plane in Boeing’s history, with nearly 4,700 planes sold or on order. The new revelations about the ill-fated jetliner come after Boeing, grappling with the fallout of the two deadly crashes, outlined upgrades to the aircraft’s software and increased training for the 737 Max pilots. Boeing said it will take about an hour for technicians to load a software update for the planes. The company’s software fixes will change the way the MCAS receives information, requiring feeds from both outside “angle of attack” sensors, rather than one, before it is triggered. The system will also have more limits on how often it will engage and Boeing will make changes that prevent the anti-stall feature from angling the plane’s nose too far downward in its attempts to correct for a possible stall. A Federal Aviation Administration spokesman said Monday that the agency expects to receive the final package of software and training updates for review “over the coming weeks,” reflecting a delay from its initial timeline. Boeing had initially planned to submit the fix for FAA review last week. Elwell painstakingly explained that Boeing’s goal in the redesign of the 737 Max was to make the plane fly exactly as previous generations of the plane had, despite the fact that the engines were somewhat larger and repositioned farther forward on the wings. To combat the additional lift provided by the new engines, Boeing introduced the MCAS system, an unprecedented computerized device designed to push the plane’s nose down to combat that added lift, and to prevent what’s known as a “stall” that could cause the plane to crash. There have been 17 generations of the 737 since it began flying in 1967, and Boeing wanted the Max to perform exactly as its predecessor, the 737 NG, had. The Justice Department’s criminal division is looking into the Max jets, while the Transportation Department’s inspector general is investigating the way they were certified, with Transportation Secretary Elaine Chao creating an “expert special committee” to review the procedures for the planes. On March 25, Ethio­pian Airlines chief executive Tewolde Gebremariam went out of his way to express his company’s continued belief in Boeing, despite repeatedly expressing concern about the Max jets. “Let me be clear: Ethio­pian Airlines believes in Boeing. They have been a partner for many years,” he said in a statement. Ethio­pian Airlines, one of the flagship companies of the country, has been engaged in a massive expansion, tripling the size of the fleet in less than 10 years to 113 aircraft flying to 120 destinations in five continents carrying more than 11 million passengers a year. Lazo reported from Washington. Ashley Halsey in Washington contributed to this report.